When you are photographing a wedding day, you want to be sure to capture every part of that day so that the couple has a beautiful timeline of photography to look back and remember each moment. That includes moments from the time they start getting ready, to the first look, the wedding party photos, ceremony, reception and everything in between. One very important part of a wedding day is when the couple is getting ready. During that time, the bride and groom are each feeling a million different emotions from excitement to nervousness to extreme happiness. They may even feel sad if certain family members are not able to attend their wedding day. As their wedding photographer, the photos that you capture will help them remember all those different emotions they felt. It is also perfect for capturing photos of the wedding gown, wedding colors, jewelry and shoes that the bride is wearing. That is also a time that the bride and her bridesmaids are spending quality time together as well as the groom and his groomsmen. We wanted to share a few tips today that will help keep you on schedule and prepared so you can take the best getting ready shots that you can for your clients. 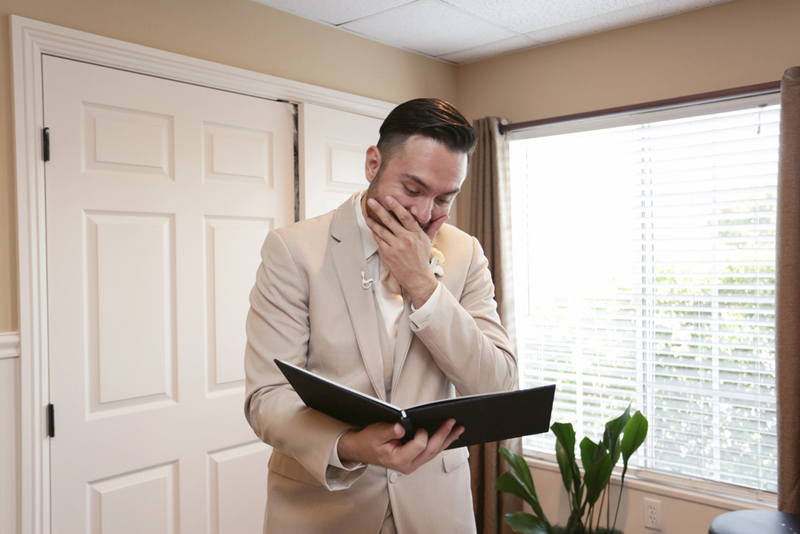 You will be meeting with the couple before the wedding day to find out what type of shots they are looking for, so also be sure to ask about the time before the wedding. Find what time they plan to start getting ready, as well as where they will be. 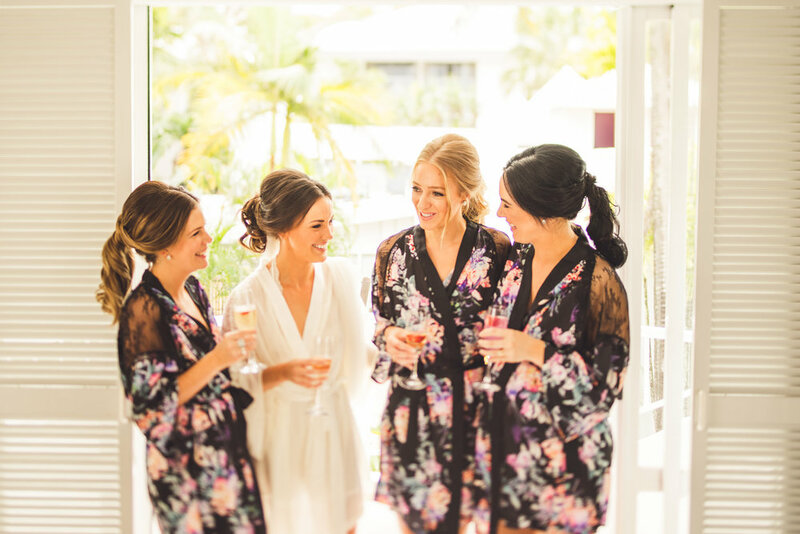 Remember that many brides get ready in a hotel room - they do not always get ready at the ceremony venue. Knowing ahead of time what their expectations of the wedding photos are, will help you have a better idea of what you need to be capturing while they are getting ready. While you are taking photos before the wedding, it is best to be flexible and just keep an open mind. Even if you have a schedule of when things will happen, you never know when it will take a little longer for hair or makeup or really anything at all. If you know that you must be flexible, you will not get flustered when things change up from the timeline that was originally planned. When the bride or groom is getting ready, everyone in the family may want to stop in and say hello. There is no need to capture all of those people in the photos. The getting ready portion of the day focuses on the bride and groom as well as the bridal party. Keep the number of people in the photos minimized... the more people in each shot, the more the focus is drawn away from the bride and groom. Perhaps the bride and her sister are sharing a sweet moment together while she is helping her getting the wedding gown on. Maybe the groom and his buddies are all having a good laugh together to relax a bit. These moments are the special ones that need to be remembered. Be sure to keep an eye out for those special times. A wedding includes so much detail. This is the best time of the entire day to capture some of those little wedding details that help make the wedding complete. A few examples could be the beautiful lace train of the wedding gown, the love note the bride wrote to her soon-to-be husband, the earrings and necklace that the bride is wearing, or the 'something borrowed' that the bride's grandmother gave her to wear. Many of these items will be harder to capture once the wedding ceremony and reception has begun, so take time beforehand to capture the little details perfectly. For many, weddings are the bread and butter of their photography business. They are an awesome way to make great money but you need to know how to find and book clients, market yourself, post-process photos and more. If you shoot weddings or hope to break into the wedding industry, you need to get this great product from BP4U. The Ultimate Wedding Photography Guide will provide you with TONS of great information and ideas to being great at photographing weddings. You can get this guide for only $12.99 (a $129 value)! 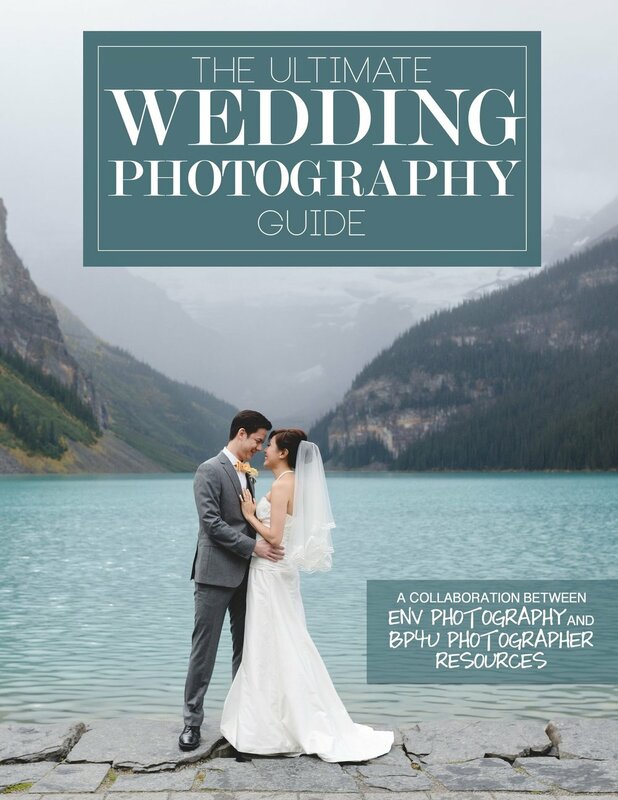 Get The Ultimate Wedding Photography Guide Here! If you photograph weddings, you will be focusing a lot on the bride and groom but you also have to be a master at shooting wedding party group photos. Today, we wanted to share this 9-minute video from Shutterbug Magazine where veteran photographer Denis Reggie will give you 7 tips for taking group photos at weddings. Watch the video below to find out tips to make sure you are taking the best wedding party group shots that you can! Those photos are ones that the bride and groom will remember forever, so you want to make sure each one captures the personalities, love and wedding day perfectly. We hope you enjoy this video. Here’s an overview of what Reggie teaches in the video. Be sure to watch so you can see actual examples of what he discusses. 1. Arrange the Wedding Party Properly - It’s important to think about where you are positioning different people in the wedding party for a group shot. 2. Use an Off-Camera Umbrella Light - Reggie uses an off-camera umbrella light to light his group shots. 3. Change the Color Temperature - Using color gels to adjust the temperature of the flash can make for a much more well-balanced shot. 4. Use the Right Gear - Choosing the right pieces of gear is essential. For example, using the right master controllers for your flashes so that you can be flexible is essential. 5. Use a Tripod - Reggie mentions that the more megapixels there are, the more “sensitive” the camera is to motion, so using a tripod is very important. 6. Pick Your Settings - Following on from using a tripod, it may be possible to achieve a slower shutter speed to deal with indoor lighting. 7. Shoot in Raw Format - Using raw allows you to fine-tune your white balance later, thanks to the non-destructive element of this key camera format. Shooting in JPEG limits your options, but raw gives you a massive amount of flexibility in post. We originally saw this video on PetaPixel. If you take photos of couples for weddings, engagement photos and more then you need to get this great product from BP4U. The Posing Guide for Couple Portraits will provide you with TONS of great pose ideas as well as tips on gear, finding clients, scouting, and even prepping for your sessions. You can get this guide for only $9.99 (a $129 value)! GET THE POSING GUIDE FOR COUPLE PORTRAITS NOW! Today's photo of the week was taken by Karen Skelly with Karen Skelly Photography in Durango, Colorado. To see more work from Karen, visit her website at www.karenskellyphoto.com. You can also follow her on Facebook. Today we are showcasing some beautiful wedding photos that photographer Priscilla Valentina took. She went above and beyond for this couple who was looking for very unique wedding photos... which was exactly what she took for them! Valentina carried her camera gear for 14 hours on a hike to Trolltunga in Norway, Valentina along with this couple and captured these captivating photos below. Enjoy! To see more work from Priscilla, visit her website at priscilavalentina.com. These photos were originally found on Australian Photography. If you are a wedding or portrait photographer, you need to check out the Posing Guide For Couple Portraits! this 209 page guide, you will get tons of pose ideas as well as tips on finding the perfect location, keeping the couple comfortable, pricing and even post processing. For only $9.99 (regularly $129.99) you can get this awesome guide today! 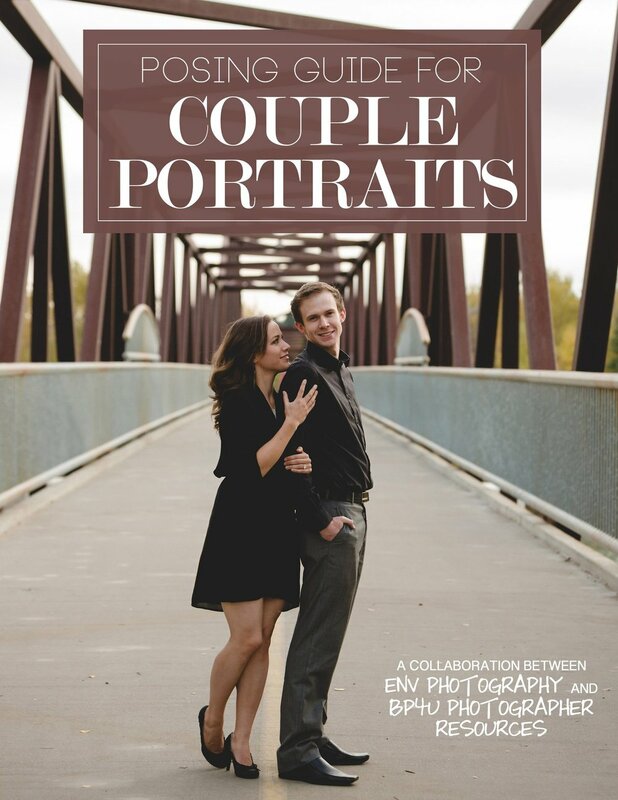 GET THE POSING GUIDE FOR COUPLE PORTRAITS TODAY! Today, we want to focus on 4 engagement session tips that are less-obvious and that are often overlooked when working with a couple. Follow these tips below and they can help you improve your photos overall and could help you to avoid things going wrong while you are out during your shoots. In general, as well as with photography, we all know that things hardly ever go as we planned for them to go. You can plan ahead but sometimes things just do not work out. If you show up for your favorite location and it’s closed for whatever reason, what do you do? Having that backup plan is very important and will help to avoid the panic of having to find a new location quickly. There is always a possibility of getting kicked out of a location due to an event taking place, or having inclement weather right during the exact time of your session. You even want to plan for things like traffic backups and road closures that can mess up your schedule. Many clients want so many different location for their engagement sessions so they have a variety. They may want beach shots, city shots, night shots, and nature shots all in one session but while you want to keep your client happy, rushing through tons of different locations within the time of the session is not the best idea. It is important to take your time with each location; being rushed increases the risk of something going wrong. Taking your time and focusing on the right expressions, ideal backgrounds, and perfect settings in one or two locations creates a better product and a more enjoyable overall experience than cramming in multiple locations in a few hours. Discuss this with your client before the day of the session so you are all prepared for those top locations and have a plan in place. Having your clients happy and relaxed makes for a smoother session. You want to make sure that as their photographer, you take the appropriate steps needed to help your clients stay happy. I your session is scheduled to go through a typical meal time, suggest that they eat prior to the shoot and it may even be helpful to pack a snack in case someone gets hungry. If there’s even the slightest chance of it being cold, make sure they bring a jacket and maybe even have a backup in your car just in case. You would hate for your session to end early because the clients get too cold. It is so important to anticipate all the possible dilemmas that can come up and plan accordingly. Ideas for different photos can stem from anything. Sometimes the client brings an idea that may be awesome or it could be cheesy or just plain bad. No matter the idea, it’s your job as the photographer to accommodate, modify, and improve their ideas to capture shots that match their personalities and their style. This will ensure that you keep your clients happy! No matter what it is that you do and love in life, you need to have a passion for it. As a photographer, you have to want to take photos, continue learning and growing to be the best you can be. Today, we want to share a little photography inspiration with you in this great video where Beverly Hills wedding photographer Joe Buissink shares is view on what photography means. If you are a photographer this will definitely change the way you look at yourself and we hope it brings you some inspiration to get out and take amazing photos! 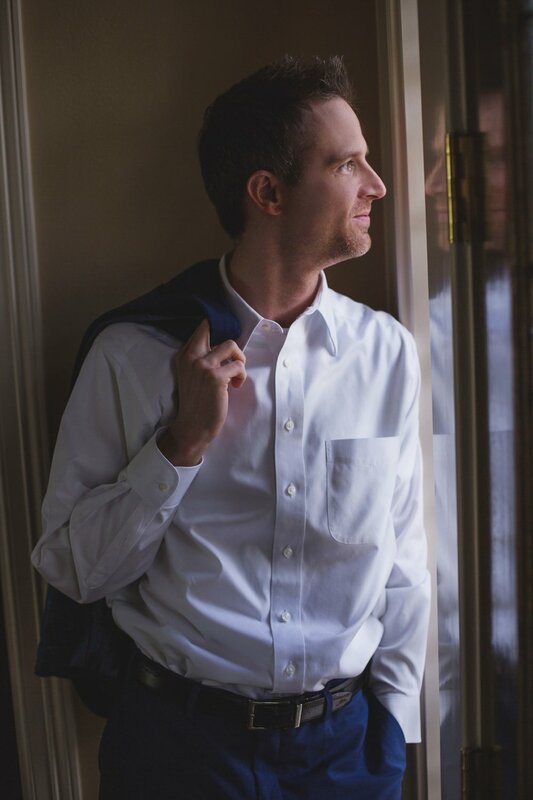 Joe Buissink started his photographic career in 1995 and has become one of the most sought after and praised wedding photographers in the world. His work is both revered in the photographic community and admired in the wedding industry and he has photographed the weddings of people such as Barry Bonds, Alyson Hannigan, Brendan Fraser, Brooke Burke, Christian Slater, Christina Aguilera, Christina Applegate, David Boreanus, Jessica Simpson and Nick Lachey, Kelsey Grammer and more. Here are a few of his amazing photos and be sure to check out his website at www.joebuissink.com! Are you a wedding photographer and take many wedding photos indoors throughout the year? The Indoor Wedding & Engagement Posing Guide would be perfect for you! You may be photographing a wedding that is outdoors but need to move photos inside due to bad weather. Or, perhaps you just need some new, fresh posing ideas while taking photos inside a church or ballroom. Get this guide today for only $15.00 (a $149.99 value)! GET THE INDOOR WEDDING & ENGAGEMENT POSING GUIDE TODAY! When you are having your first conversations with a possible wedding client, you may be tempting to follow up with them numerous times until you finally hear back. But sometimes that is not always the best way to move forward. No photographer works exactly the same way but the way you correspond with clients from the beginning is very important to whether or not they respond to you at all and can also make a difference if they actually book you to shoot their wedding. Are you in need of some different ideas and ways to reach out to clients and to communicate with them throughout the wedding timeline? Photography Basics - Wedding Day Workflow, a BP4U guide written by Ann Louise Photography, is the perfect guide to sit down with when you are a photographer looking to break into the wedding industry or if you feel you need a refresher or new ideas to add to your own wedding photography business. GET PHOTOGRAPHY BASICS - WEDDING DAY WORKFLOW NOW! ON SALE TODAY FOR ONLY $29 (A $299.99 VALUE)! Should You Follow Up Multiple Times After Their First Inquiry? Many photographers may feel like they should follow up with an inquiry numerous times. Ann Louise Photography feels differently. As they talk about in this guide, when they first get an inquiry from a possible wedding client, they will follow up with an email or call within 48 hours and then will not follow up again if they do not hear back. They say in the guide, "Once we send the initial stock email, we don't send another one. We find that if the client is serious and in love with our work, they will reply back. This helps us target our clients and really get in with niche clients who appreciates our artwork." What Should You Say In Your Initial Outreach? Your first email to a potential client is important. It is the first time that the bride or groom is going to hear from you so you want to be professional and provide just enough details to make them want to meet with you in person or chat over the phone. So what are some of the details you should include in that email? Tell them a little about your company. Have you won any awards or been published in a really great publication where they can check out your work? Give them a base for your pricing. Do not go into tons of detail on all your prices yet, but perhaps a quick overview of your basic and most popular wedding package and it's starting price. This gives them enough information to know if you are over their budget or not. Even though you want to book as many great clients as you can, you do not want to waste time with someone who does not fit into your budget. Ask them to come in and meet with you in person. It is always best to get that in-person meeting scheduled early. Then you can see the couple, find out what it is they are looking for and then show off the work that you do. Tell them to send you days that they are available so you can get that meeting set. Let them know if their date is available if they provided that information to you. If their wedding date is still TBD, let them know how far out you are booking at that time. Even though many of these items are known by many, it can be very easy when you are busy to send a quick email that leaves out some of this important information. Perhaps, you can create a template for this introduction email that you can keep handy and then just customize here and there as needed. That will help to save you time... and we all know that your time is precious. This Wedding Day Workflow has tons of great information and ideas for communicating with your clients from the first inquiry to the final email after the wedding has happened. It is so important in the wedding industry to communicate effectively with your clients to keep them happy and in the know. Communication is the key to success and your clients now will be your references for future work that you do and you want them to be impressed with every part of your work. To get even more great tips and templates, get Photography Basics: Wedding Day Workflow today. Ann Louise Photography will walk you through one of their weddings from the first inquiry through the wedding. They will also walk you through taking photos the day of the wedding and SO much more. Weddings are such amazing events to photograph. You are documenting one of the most special days of the couples' life and you want to be sure you take the absolute best photos you can. But, the wedding goes by fast and you only get one shot to take those photos while the ceremony and reception are taking place so you have to do it correctly the first time. If the couple you are photographing are saying 'I do' in a church, you will find that the lighting can be tricky and many times it is darker than normal. This makes getting sharp and colorful images much more difficult. Using a flash during a wedding ceremony in a church is usually frowned upon and even if the couple doesn't seem to mind you using a flash, it can be very distracting and bad form. Remember, you are trying to stay in the background so you are not noticed while still capturing amazing photos. So, what can you do to make sure the ceremony photos turn out amazing even if there is low-light? Read below for 3 tips to taking great wedding photos in a church. A full frame camera will give you a better low-light performance and more quality images at higher ISOs. A larger camera sensor is able to capture more light in your photos than a crop-sensor camera. Make sure that you manually change your camera settings to shoot in lower light. The ISO tells the sensor in your camera to be more sensitive to light so keep in mind the higher the number, the more sensitive to light it is. You want to try and keep your ISO as low as you can to make sure your photos look as clear as they can. You want to also remember to keep your shutter speed around 60 and your aperture at 2.8 or lower - these settings allow the most light in. You want to be sure during a low light wedding ceremony that you keep your camera as still as possible. One great way to do this is with a monopod which makes it easy to use and move around and not be noticed. While shooting a wedding, you have to be prepared for all types of lighting throughout the event. You will be taking photos outdoors, in rooms where the bride and groom are getting ready, during the ceremony and at the reception. All of these photos are in different places, at different times of day, with different amounts of natural light or even the lighting dimmed inside the venue. You need to be prepared for every type of lighting scenario so you can be sure to capture every wedding photo of the bride and groom and their wedding day in the best possible way. Today, we want to share with you 3 wedding photography lighting tips to keep in mind when you are photographing a wedding. It’s easier to balance exposures with off-camera lighting and you get better skin tones when you do so which is so important when taking wedding photos. Perhaps you can start with speed lights and then and then advance to studio systems with light-shaping tools such as softboxes, grid diffusers, and umbrellas. If you know you will want more more flexibility while shooting, you can use wireless triggering systems to fire your camera and flash. When it comes to a wedding reception, you really need to bring extra lighting. Many times the reception is in a dark reception or outdoors in the evening when the sun has already set. If you want your photos to turn out at all, you need to learn how to use strobe lighting. The easiest way is to use a bounce flash where you simply use the flash on top of your camera angled towards white walls to create soft directional light on your subjects. You could also use kicker lights placed throughout the reception that are behind the subject you are shooting to help light them up from behind and make them really stand out. Most of the important events throughout the reception take place on or around the dance floor. The bride and groom's first dance, the toasts, the bouquet toss and all of the fun dancing goes on there. Finding a spot that is off to the side and out of the way that also faces the dance floor is probably the best option for your lighting placement. Are you a wedding photographer and know that some things just do not go as planned. Sometimes you have to find a plan B when the weather does not agree and you have to stay indoors rather than use the gorgeous outdoor scenery you wanted to utilize in the wedding photos. The Indoor Wedding & Engagement Posing Guide is for you! For $149, you can learn when it is best to reschedule your shoot due to rain, shooting in the rain, using indoor elements and SO MUCH MORE! GET THE INDOOR WEDDING & ENGAGEMENT POSING GUIDE NOW!